I have to say, Brandy Melville is getting popular! And I love it! Luckily, I have a location nearby me but I’m coming across a problem. 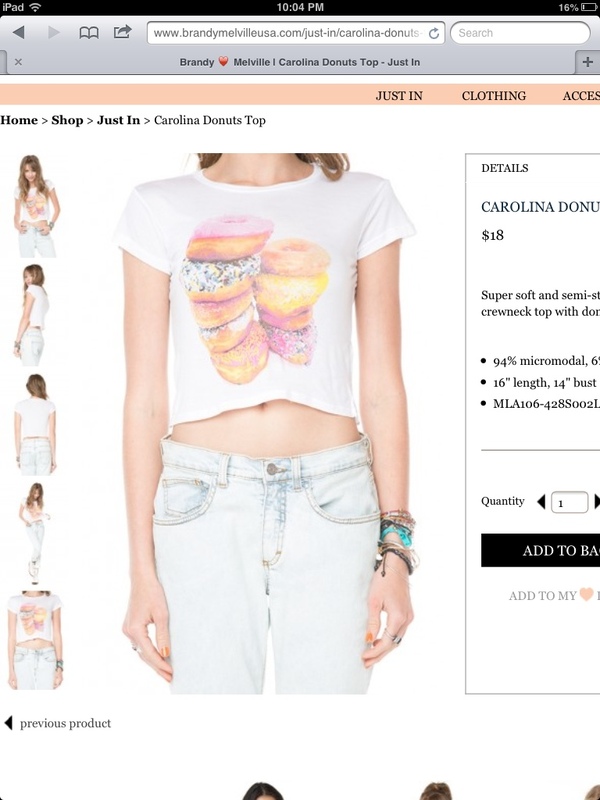 They do not ever seem to have this donut shirt in stock! Right when I first saw it, I was completely obsessed and I had to get it. I mean, obviously. It has donuts on it! They have every other new shirt in stores… Except for this one….____. I suppose there is only one solution – because I don’t plan on spending $100 online for free shipping. I guess I’m just going to have to call the store and ask them to hold on to it if they have it. Hopefully it’s not a ticked off employee who slowly explains you need to come to the store and purchase it and how it’s against store rules to have it kept. Let me know if you’ve done this before because I don’t want this to turn into a problem. But, either way, I adore Brandy Melville. Cute clothes, reasonably priced, and have you ever noticed how soft their shirts are? !